As with most US National Parks, there are different fee options to enter Glacier National Park. The current fee and pass structure is relevant until at least May 1st, 2018. There is a proposal to increase the fees, which is still under review. If accepted, this proposal will increase some of the following fees and will take effect May 1, 2018. 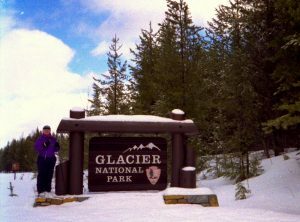 Please check the Glacier National Park website for updated information. The wonderful thing about Glacier National Park is that you can access it every day of the year. Plus, the gates are open 24 hours a day. So, whether you want to enjoy a daytime activity such as hiking, boating, etc.or a full moon midnight bike ride to Logan Pass, or a cross country ski adventure, you will have access to Glacier Park. However, vehicle access is restricted on the Going-To-The-Sun Road over Logan Pass for part of the year. From the West Glacier Entrance, the road is open to Lake McDonald Lodge year around. From the Saint Mary Entrance, the road is open to the foot of Saint Mary Lake year around. But during the winter/snow months, this road is closed to vehicle traffic between Lake McDonald Lodge and the foot of Saint Mary Lake. You can cross country ski, snowshoe, or hike the full Going-To-The-Sun Road most of the year except while they are snow plowing it. The maintenance crew of Glacier National Park starts plowing the Going-To-The-Sun Road the first part of April. Giant snow blowers, bull dozers, excavators, and snow plows are used to clear the Road, and prep it for vehicle access. In recent years, the entire Going-To-The-Sun Road typically has opened to vehicle traffic in the middle to late June and closed between the middle of September to the middle of October. When it opens and closes is purely weather dependent and at the discretion Park management. Up until 2006, Park management and maintenance crews made it a priority to get the Road open as soon as possible. Except for record snow years, they had the Road open before the middle of June, in some cases, open before the end of May, and they strived to keep the Road open as long as possible. Until 2007, it closed between the middle of October to the middle of November. From 2006 on, the earliest Going-To-The-Sun Road opening is June 16th, 2016 but most of the opening dates have been late June to early July. The very earliest opening of the Going-To-The-Sun Road was in 2005 on May 22nd. The latest opening of the Road since its inaugural opening on July 15th, 1933 was on July 13th, 2011. The earliest closing of the Road was on September 16th, 2007 with the latest closing of November 16th, 1987. There are seven entrances to Glacier National Park. Only three of these entrances connect to the Going-To-The-Sun Road, as follows; the West Glacier Entrance, the Saint Mary Entrance, and the Camas Creek Entrance. The other four entrances to Glacier Park are the Polebridge Entrance, the Two Medicine Entrance, the Many Glacier Entrance, and the Cut Bank Entrance. Three of these entrances are on the west side of Glacier Park – the West Glacier Entrance, the Polebridge Entrance, and the Camas Creek Entrance. The West Glacier Entrance is the main entrance to the Park where the Park Headquarters are located, also the closest entrance to Smoky Bear Ranch. The Polebridge Entrance gives you access to the remote North Fork area of the Park. And the Camas Creek Entrance gives you access to the Going-To-The-Sun Road via a quiet, scenic drive. Of the four entrances on the east side of Glacier Park, the Saint Mary Entrance is the only entrance which gives you access to the Going-To-The-Sun Road. The Many Glacier Entrance gives you access to the Many Glacier area. The Two Medicine Entrance give you access to the vertical Two Medicine area. And the Cut Bank Entrance only gives you access to back country trailheads. The closest airport to Glacier National Park is Glacier Park International Airport. This airport is roughly a 20-minute drive to Smoky Bear Ranch. Three airlines service this airport – Delta Air Lines, Alaska Airlines via Horizon Air, and United Airlines. When arriving on any of these airlines, you will pass through one of their hubs. The Delta Air Lines hubs you’ll pass through are either in Salt Lake City, UT or Minneapolis, MN. The Alaska Airline via Horizon Air hub you’ll pass through is in Seattle, WA. And the United Airlines hub you’ll pass through is in Denver, CO.
Glacier Park International Airport is usually not the least expensive to fly into. Other airport options that may be less expensive are the Missoula International Airport, the Great Falls International Airport, or the Spokane International Airport. Of course, arriving at one of these airports will increase your drive time. The Missoula International Airport is about a 2½ hour drive to Smoky Bear Ranch. The Great Falls International Airport is about a 3½ hour drive to Smoky Bear Ranch and the Spokane International Airport is about a 5 hour drive to Smoky Bear Ranch. There are four Amtrak Stations you can use to arrive for your vacation to Glacier National Park. The only station that provides checked luggage service is the Whitefish Amtrak Station. It’s roughly a 30-minute drive to Smoky Bear Ranch. The West Glacier Amtrak Station in West Glacier is just outside the West Glacier Entrance to Glacier Park. It’s roughly a 15-minute drive to Smoky Bear Ranch. The East Glacier Amtrak Station is located in East Glacier. It’s roughly a 15-minute drive to the Two Medicine Entrance of Glacier Park or 1½ hour drive to the Saint Mary Entrance to the park. The fourth Amtrak Station is located at Essex. Essex is located along Highway 2 about halfway between West Glacier and East Glacier. There is no easy access to Glacier Park from this Amtrak Station. At Glacier Park International Airport, Avis, Budget, Hertz, and National/Alamo all have in-terminal car rental counters. Dollar, Enterprise, and Thrifty will deliver a rental car to the airport for you. You will receive instructions on how to pick up your vehicle from these companies when you reserve it. Hertz will deliver a reserved rental car to the West Glacier Amtrak station. Again, you will receive instructions on how to pick up your vehicle when you reserve it. The West Glacier Amtrak station does not provide baggage service. If you want to check baggage, you will want to arrive at the Whitefish, MT (WFH) Amtrak station. Budget, Hertz, and Dollar will deliver a reserved rental car to the Whitefish Amtrak station for you. You will receive instructions on how to pick up your vehicle from these companies when you reserve it.